Gastrology bloggers dined courtesy of Crust. Crust has just unveiled three exciting new pizzas inspired by traditional street food dished out in Asia and South America. Highlighting ingredients that are big in flavour, their trio of pizzas – the Siracha Beef, Moorish Lamb and Kimchi BBQ Chicken – are available for a limited time only. 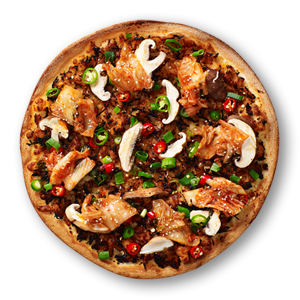 We ordered our Kimchi BBQ Chicken crust pizza from the Armadale store. Ready in less than 15 minutes, we were excited to devour it. We absolutely adored the combination of the tangy and spicy kimchi and the tender morsels of BBQ glazed chicken. It was a surprisingly delicious combination which worked wonders.